Class implementing a local channel to create faces. Channel can create faces as a response to incoming IPC connections (UnixStreamChannel::listen needs to be called for that to work). Definition at line 45 of file unix-stream-channel.hpp. Create UnixStream channel for the specified endpoint. 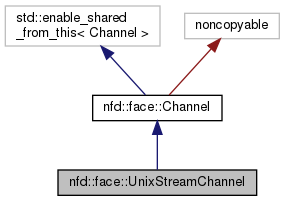 To enable creation of faces upon incoming connections, one needs to explicitly call UnixStreamChannel::listen method. Definition at line 39 of file unix-stream-channel.cpp. Definition at line 51 of file unix-stream-channel.cpp. Definition at line 72 of file unix-stream-channel.hpp. Referenced by listen(), and ~UnixStreamChannel(). Definition at line 78 of file unix-stream-channel.hpp. Enable listening on the Unix socket, waiting for incoming connections, and creating a face when a connection is made. Definition at line 64 of file unix-stream-channel.cpp. References nfd::getGlobalIoService(), isListening(), NFD_LOG_CHAN_DEBUG, NFD_LOG_CHAN_TRACE, and NFD_LOG_CHAN_WARN.